This page address what the functional and practical differences are between the three main brands of road bike gearing systems and derailleurs: Campagnolo, Shimano and SRAM. The advantages of electronic versus mechanical shifting are also discussed. Nearly all modern gear shifting systems and derailleurs at most levels from the major brands (Campagnolo, SRAM, and Shimano) function well. Choosing between them often comes down to personal preferences in ergonomics and aesthetics but there are a few objective differences. Most websites are too worried about losing advertising money from the big brands or upsetting people in the industry to criticize or directly compare the options; fortunately, I’m not in a position to care about that and so I just tell it directly how I see it. Each major component brand sells several different groupsets at different price levels. The top-tier groups: Shimano Dura Ace, SRAM Red, and Campagnolo Record / Super Record offer very minimal improvements over the second-tier groups, so are only really suitable for people who like to flaunt their wealth or who receive parts through sponsorship. The second-tier groups (Ultegra, Force, and Chorus) work extremely well and are good value for money, but for people who are more price-sensitive, there is nothing wrong with the third-tier groups (105, Rival, and Athena). Some of the functional differences start to be noticeable and the weight starts to increase more significantly once reaching the fourth-tier component groups (Tiagra, Apex, Veloce) and lower (Shimano Sora and Tourney), so it’s hard to recommend those to anyone who is into ultracycling and so is using their equipment for a serious number of hours and kms unless money is their main criterion. Even so, the latest generation of Shimano Tiagra (series 4700, new for 2016) is a significant improvement over the previous generation and is certainly the best of the more budget-oriented groups. In terms of shifting ergonomics, despite having had SRAM mechanical road groups on a couple of my bikes, I’ve never been happy about there being only one lever to shift both up and down gears, but other people are totally comfortable with this. One person who completed the Trans Am Bike Race with SRAM levers reported how the skin on his knuckles was worn away by rubbing the back of the brake lever every time he shifted, but again other people have not had that problem. The ergonomics of Campagnolo’s mechanical shifters are superior to SRAM’s due to having two independent levers, but unfortunately SRAM and Campagnolo both have what I view as a design flaw in that to pull the derailleur cable, the smaller and somewhat more fragile shift lever behind the brake lever must be pushed, which can take a reasonable amount of force. After many shifts, this lever can become fatigued and break off, which I’ve experienced with a Campagnolo lever on my own bike and I’ve seen several people come into the bike shop where I work with both Campagnolo and SRAM levers that are broken in this way, sometimes after only one or two years of moderate use. Shimano levers avoid this problem by having the far more robust main brake lever be the one that is used to pull shift cable and the more fragile shift lever behind it only releases cable, which requires far less force. SRAM’s shifting tends to have a more positive and direct feeling than the other brands. I believe that this is partly because the return spring in SRAM rear derailleurs is stronger. Personally, I prefer the smoother and quieter shifting of Shimano and Campagnolo. SRAM Red is the lightest group, with Campagnolo Super Record being very close behind. This trend continues below the top-end models, with SRAM’s options generally being the lightest available at any given price. Shimano parts are often heavier than the other two brands, but this is not always a negative because it reflects the fact that Shimano prefers to build components that are robust and reliable rather than minimizing weight. Despite there being measurable weight differences, those differences are very small between brands (about 100-200 grams between complete groups of equivalent quality), and are not much bigger between different groups within a brand (maybe 200-300 grams between each quality level). As I’ve shown elsewhere, even a 1 kg Weight Differences has a minimal effect on average cycling speed across an entire route, so weight is not a criterion that I consider to be very important anymore; functionality, ergonomics, and reliability are far more important. Chains are interchangeable between brands for 11-speed groups. Tests have shown that Shimano chains tend to be the most durable. 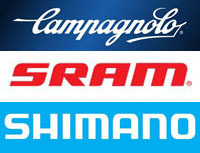 Campagnolo are not far behind, and SRAM don’t do so well on this criterion. Campagnolo 11-speed chains require a special tool to install, but a quick-link can be used with any of the three brands to simplify road-side repairs. 11-speed cassettes from all three brands have the same spacing, and so are interchangeable (the only difference being that Campagnolo cassette need a different body on the wheel). The spacing on Campagnolo 10-speed cassettes is different from both Shimano and SRAM, which themselves are interchangeable. All three brands now offer 11-speed rear derailleurs that officially handle a cassette with up to 32 teeth, which I consider to be essential for ultracycling if a road double crank is used, this is covered in detail on the next page on Gear Ratios. Shimano cassettes tend to offer the smoothest shifting and have the most logical progressions of cog sizes. Electronic shifting offers several advantages for ultracyclists, but also a few disadvantages. One major advantage is the ability to change gears from multiple hand positions – on the aerobars as well as at the brake levers. Another major advantage is the minimal effort required to make a shift, which can be particularly important if hand problems develop (which is a very common issue for ultracyclists, see the Hand Comfort page). The final major advantage of electronic shifting is how fast and precise the gear changes always are. The difference between electronic and mechanical shifting is less noticeable when using a stock cassette and chainrings of the sizes that the derailleurs were designed for (because the mechanical groups are already very good), but if you customize your Gear Ratios then electronic shifting can be a big help to ensure smooth shifting every the time. You can also shift gears without easing off of the pressure on the pedals with electronic shifting much more easily than with mechanical shifting. An obvious disadvantage of electronic shifting is that it costs significantly more than a mechanical setup of similar quality and there is no electronic version available for lower-tier groups. 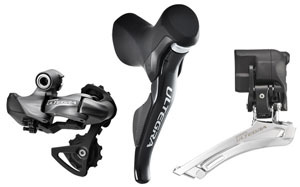 Shimano Ultegra Di2 is certainly the best-value electronic groupset available, but it is still expensive. Another disadvantage is that certain problems with electronic shifting may be a lot harder to repair or troubleshoot than with mechanical shifting; however, reported incidents are so rare that the risk is low, and failures can also occur with mechanical systems. Finally, the batteries of electronic derailleurs need to be recharged occasionally. Typical recharge intervals are every 1000-1500 kms, or more often in very cold weather. It’s easy to carry spare batteries for Shimano Di2 and SRAM eTap systems, but changing the battery is not really possible with a Campagnolo EPS system. The charger should be carried when bikepacking, and the EPS charger is the largest of the three. In terms of ergonomics, Di2 and EPS both work well, with the only problem being that Campagnolo doesn’t offer buttons that can be mounted on the bar tops (which Shimano calls “climbing shifters”). Unfortunately, the eTap levers require you to press two buttons simultaneously, one with each hand, to shift the front derailleur, and you can only move the rear derailleur in a single direction with each lever/hand. Since one of the major advantages of electronic shifting is being able to easily control the derailleurs from multiple hand positions in different places on the bars, and another is the ease of control even when experiencing hand problems, SRAM seems to have missed the point and made the system less easy to use than any mechanical group in this respect. They claim that eTap shifting is intuitive, simple, and easy to learn, but that doesn’t mean that it’s also convenient and practical. In terms of function, I find SRAM eTap to be a bit primitive because the front and rear derailleurs are not connected and don’t appear to communicate. The other two systems adjust the position of the front derailleur depending on which rear cog the chain is on to prevent the chain from rubbing on the front cage when on the extreme rear cogs. SRAM tries to avoid chain rub by having a front derailleur that is shaped and angled so that it won’t rub, but this is difficult to setup perfectly, so in practice it doesn’t always work as intended. In addition, Shimano Di2 changes the way it makes the front shift depending on which rear cog the chain is on to help prevent the chain from derailing, but SRAM eTap performs the same front derailleur movement regardless of chain angle. Finally, SRAM eTap is known to make shifts marginally slower than the other two groups. This is partly because after an eTap lever is pressed, the system must wait a moment to see if the other lever is also pressed to know whether a front or rear derailleur movement is being requested; the other two systems don’t have to pause to wait for this information and can start to execute the shift immediately. The functional differences between the groups are all minor and all groups work great but SRAM eTap just seems a bit more primitive in the way it functions. It’s possible for Garmin bike computers, and models from some other brands, to receive signals from all three brands of electronic shifters to show the current gear and the battery level on the screen. With Di2, the XTR/XT front junction box can be used in a road setup that also shows this information. Of the three groups, I therefore prefer Shimano’s Di2 system. I dislike eTap due to the poor ergonomics and I’m not a fan of EPS due to the battery issues and limited control options. Shimano Di2 is also the most versatile due to offering many compatible parts (control buttons, gear displays, and mountain bike and road bike groups that can be somewhat interchanged). Dura Ace Di2 functions the same as Ultegra Di2 with the only differences being a small and unimportant weight difference and a very large price difference, so I recommend Ultegra Di2 as the best electronic groupset. For me, the advantages of electronic shifting far outweight the disadvantages, so I recommend Ultegra Di2 as being the best group available if it is within your budget. In mechanical groups, I again prefer the ergonomics of Shimano levers and find that their parts are the most reliable. Shimano Tiagra is a good budget choice, but the fact that Shimano 105 is an 11-speed group normally makes it worth the extra money. Shimano Ultegra doesn’t offer much of an advantage over 105 in the mechanical groups, but is slightly lighter and has a higher quality finish, so both are good options. For an independent opinion on this topic from a separate source, check out the information posted on In The Know Cycling or BikeRadar. This page is in the Bikes & Components section. All modern groupsets generally work very well, so there are no particularly bad choices. For me, a more important decision is what Gear Ratios to use.